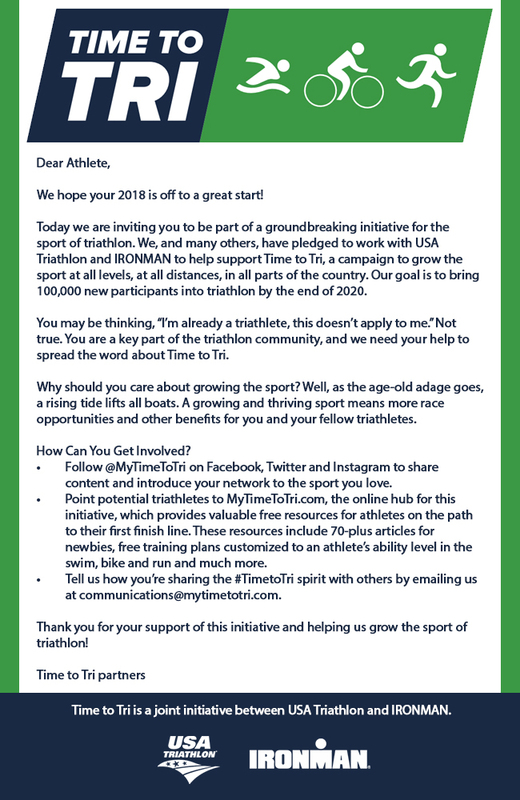 Time to Tri is a new, unprecedented initiative within the triathlon industry to grow the sport of triathlon by proactively recruiting and supporting athletes as they train for and compete in their first race. The initiative, a strategic joint effort between USA Triathlon and IRONMAN, was unveiled in early 2018. The overarching goal is to increase triathlon participants by 100,000 nationwide by the end of 2020. Pledge your support or commit to your first triathlon at the Time to Tri website.